Muña Oil can assist in cases of altitude sickness or altitude sickness it opens the bronchi (chest) and repels sickness, it stimulates the prevention ofvarious types of e breathing problems throughout the system, it is an excellentantibacterial and in the Peruvian Andes. can assist in cases of altitude sickness or altitude sickness it opens the bronchi (chest) and repels sickness, it stimulates the prevention of various types of e breathing problems throughout the system, it is an excellent antibacterial and in the Peruvian Andes it is used as a herbicide, it’s a Phenomenal air freshener and it has a delicious aroma of mint and herbs, use an electric diffuser or with a candle for this therapy. 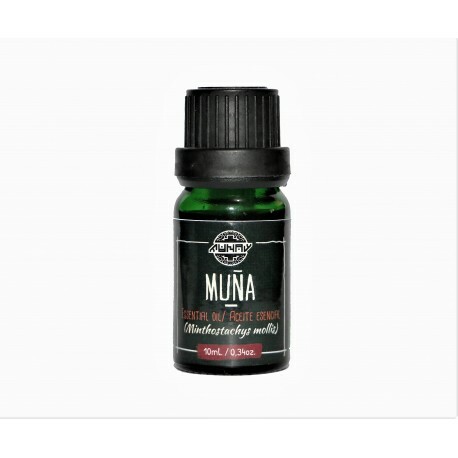 A few drops of Muna oil in a vehicular oil is able to provide an exceptional revitalizing massage, it's great for after long walks, revitalizes and revives.